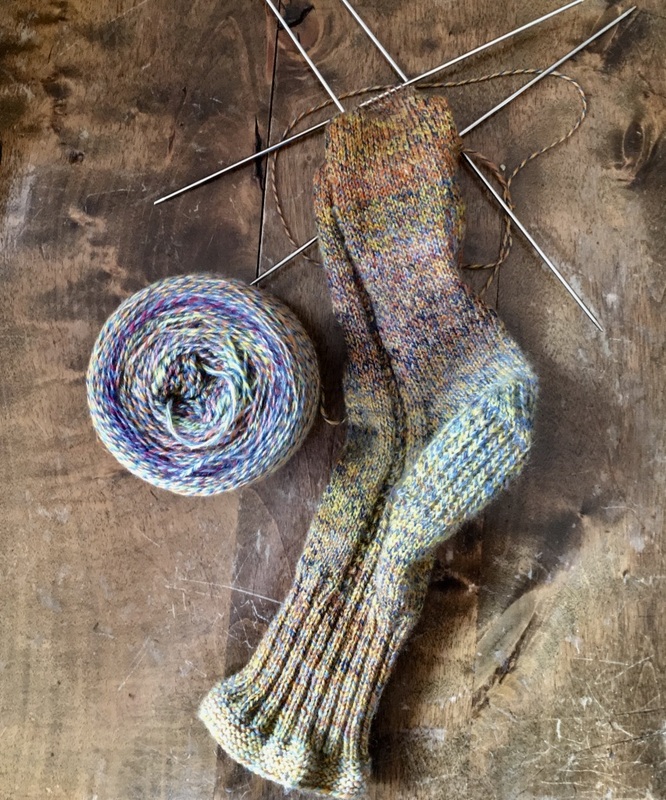 I’ve almost finished a pair of socks from the spindle spun 4-ply yarn I showed in my previous post. Twisted stitch cables. I like that detail in thin socks. I love the way my yarn knits up and how it feels! 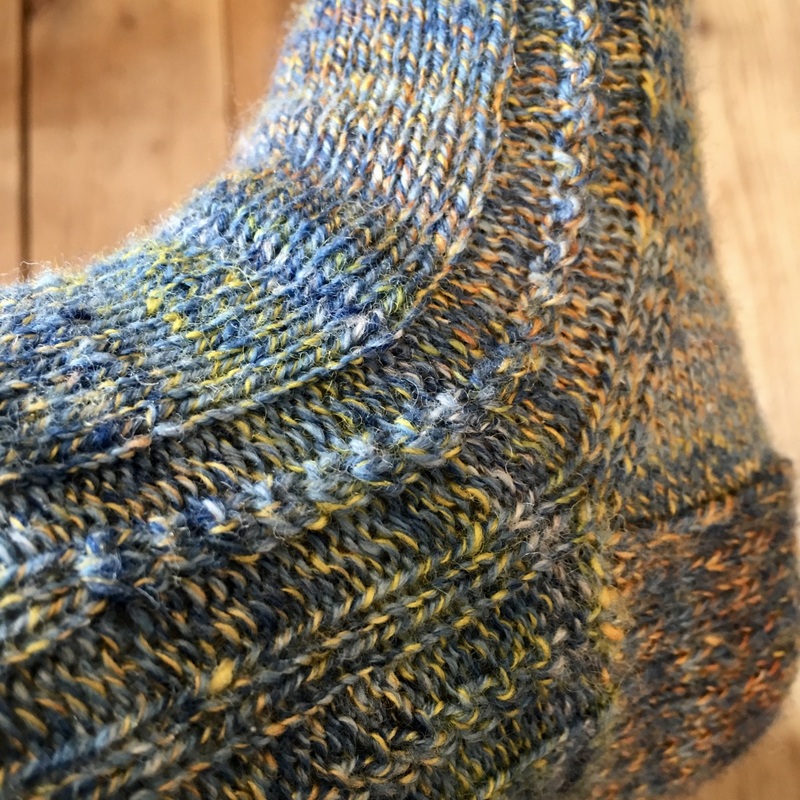 Merino and silk, two of my favourite fibres in socks. Strong and soft if you spin it thin with much twist and four plies. The second sock is almost finished also, and I have enough yarn for another pair. Needle size 2 mm. 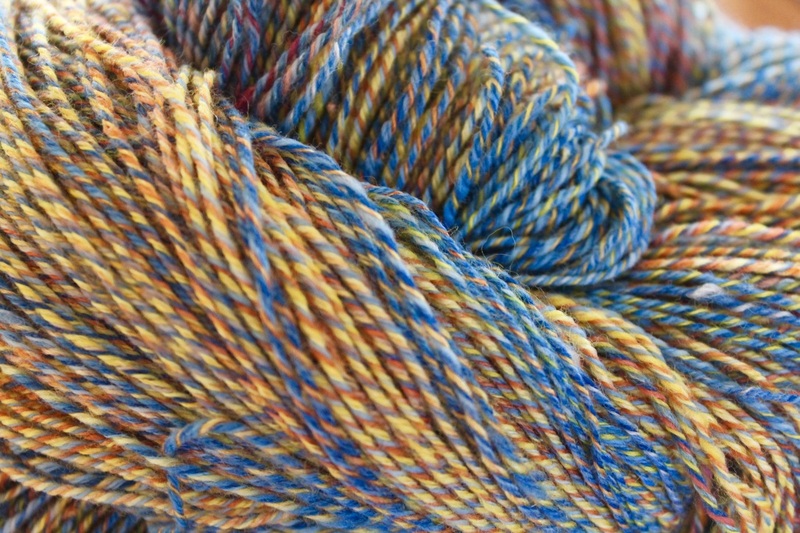 I use dpns with thin yarns, as I don’t like the way cables behave with needle sizes smaller than 2,5 mm. The yarn gets stuck in the join, however high class cables I use. I also love the feel of good steel like in the old days when I knew nothing about magic loop (which I normally use in almost all my knitting). 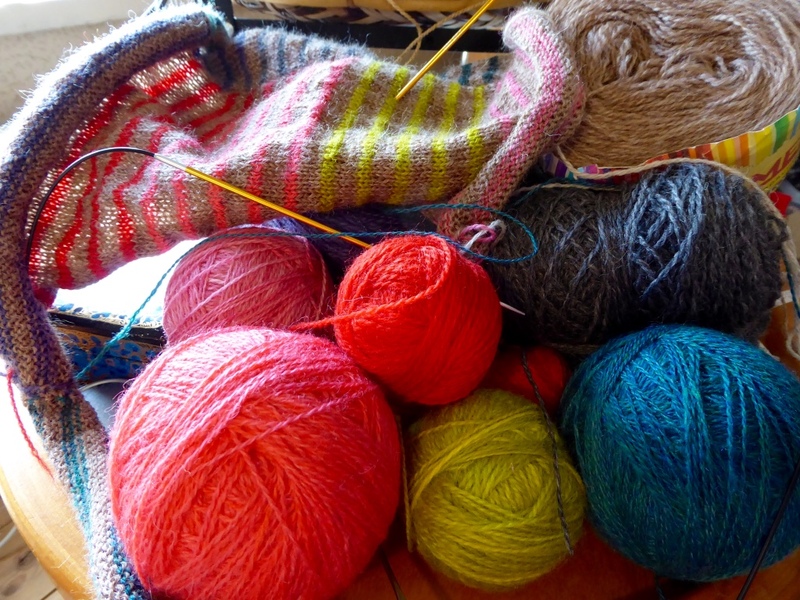 I’ve started the next sock yarn with odds and ends from my stash. I found an interesting blend in a bag with Botany Lap Waste from World of Wool: I think it’s Muga silk and dark brown Cashmere. I only have a few grams, so I’ll let it go into a sock yarn. Maggie spindle from Magpie Woodworks, an absolute favourite. The thin sweater and the thin 4-ply sock yarn I showed in my previous post are finished. 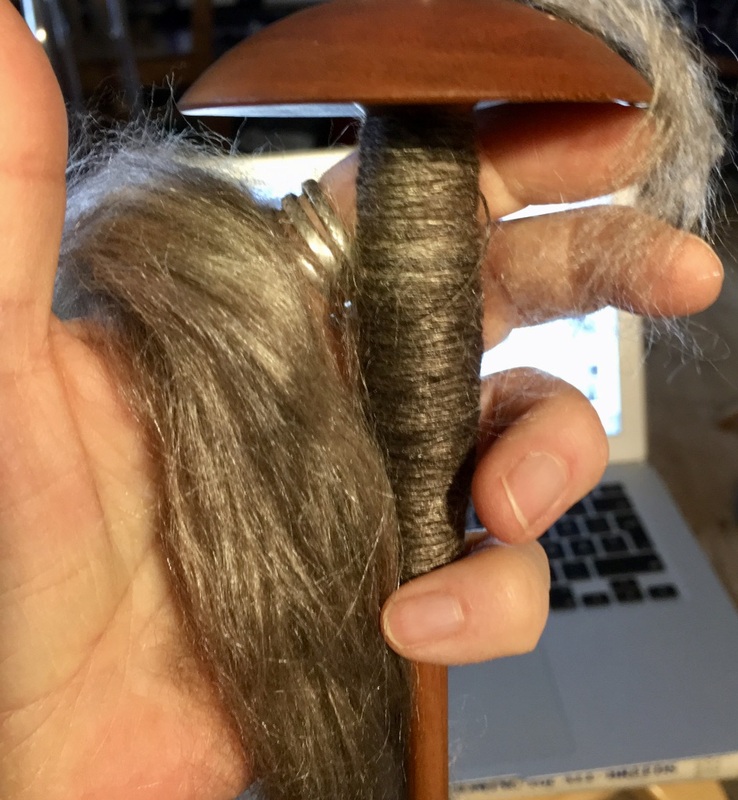 I spun this yarn on several light weight top whorl and Turkish spindles. 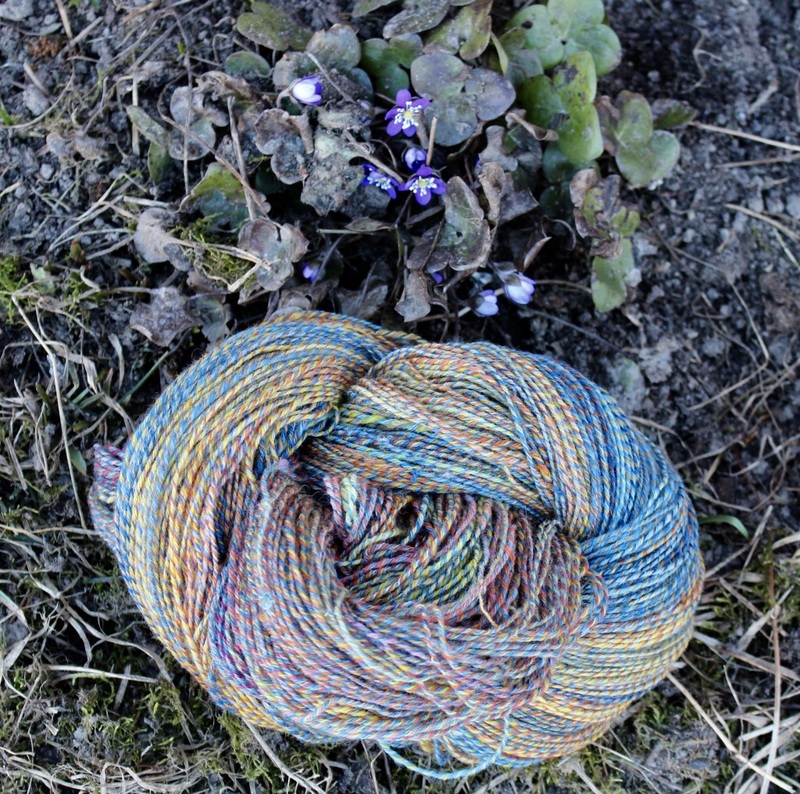 Merino and Merino-silk left overs. I think needles 2,25 or 2,5 mm. 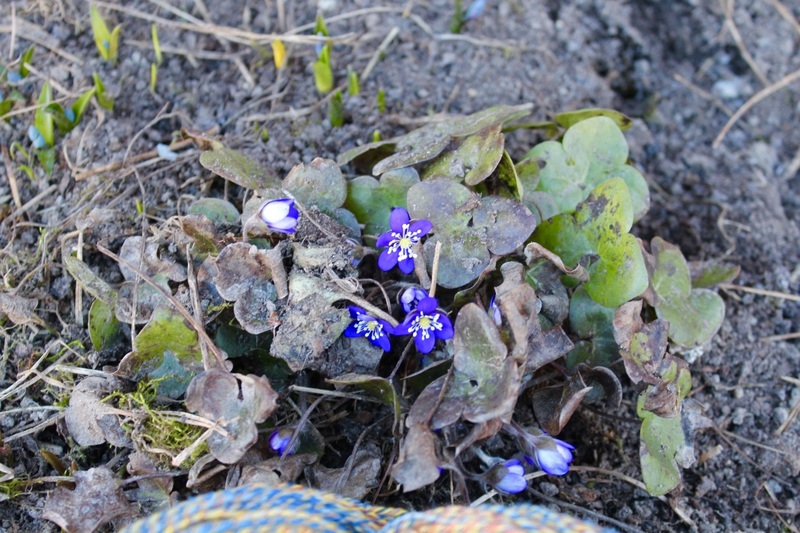 The liver leaf is one of the first flowers in spring. I love them! 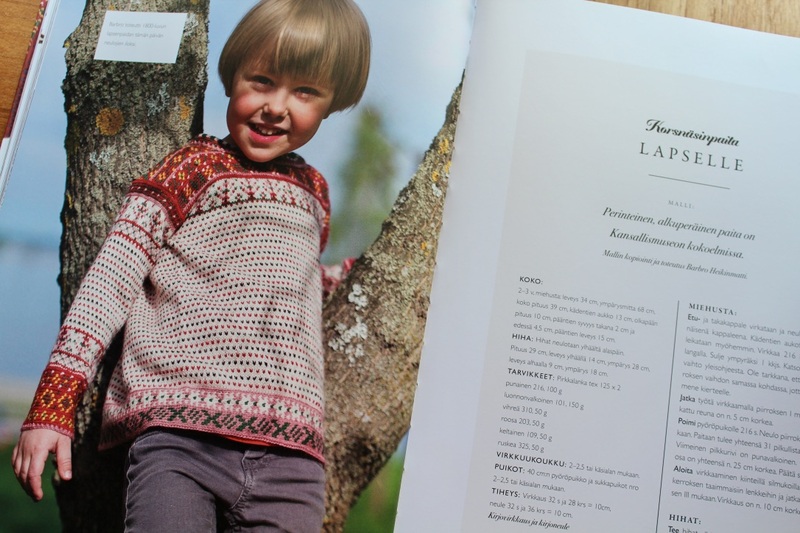 About a year ago I was asked if I could make a Korsnäs sweater for a new book “Lankapaitoja”. I happily said Yes, I can! The writers Marketta Luutonen and Anna-Maija Bäckman are both accomplished writers and editors, and both have done a life long work in craft associations. 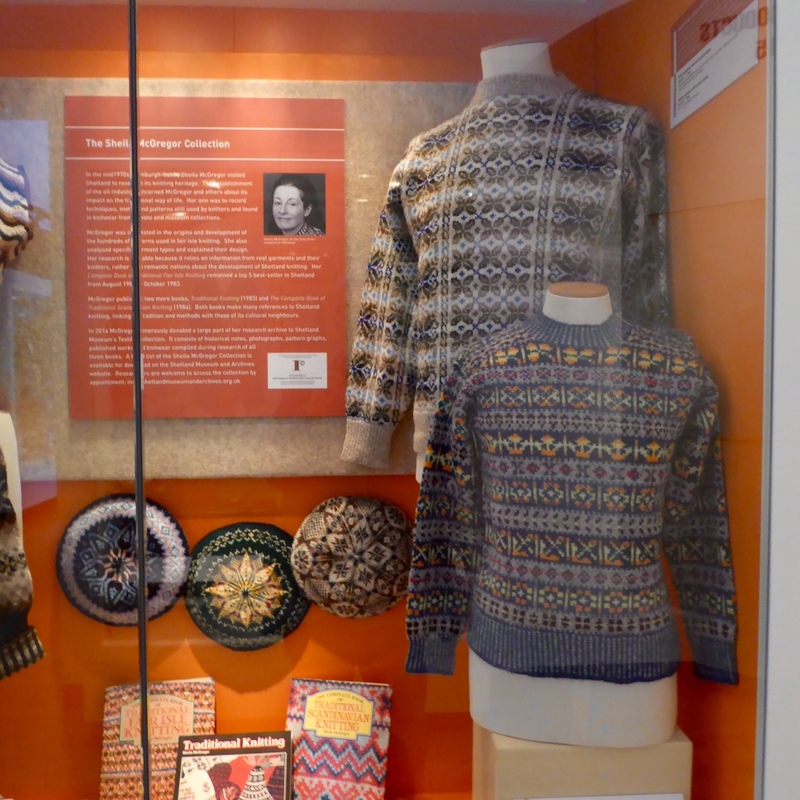 Marketta wrote her doctor’s thesis about sweaters: “Rustic Product as a conveyor of meaning, A Study of Finnish Pullovers” (text in Finnish). 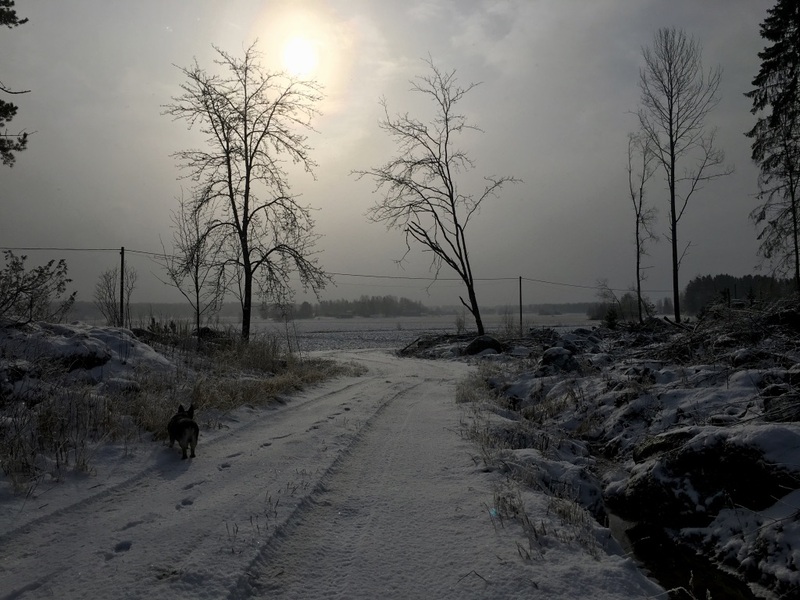 The gorgeous photos in Lankapaitoja are taken by Anna-Maija’s husband Gunnar Bäckman, who worked as a professional photographer for many decades. 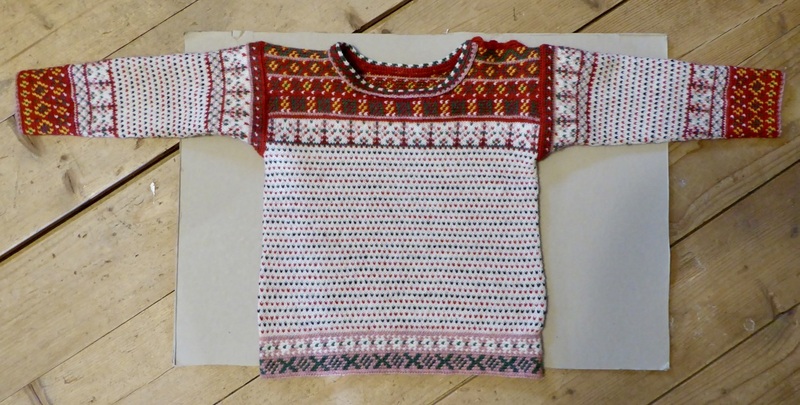 The sweater I made a copy of is in child’s size, 2-3 years old. The original is in the Finnish National Museum. I got two photos to work from, which wasn’t a problem as they were taken by Gunnar Bäckman. 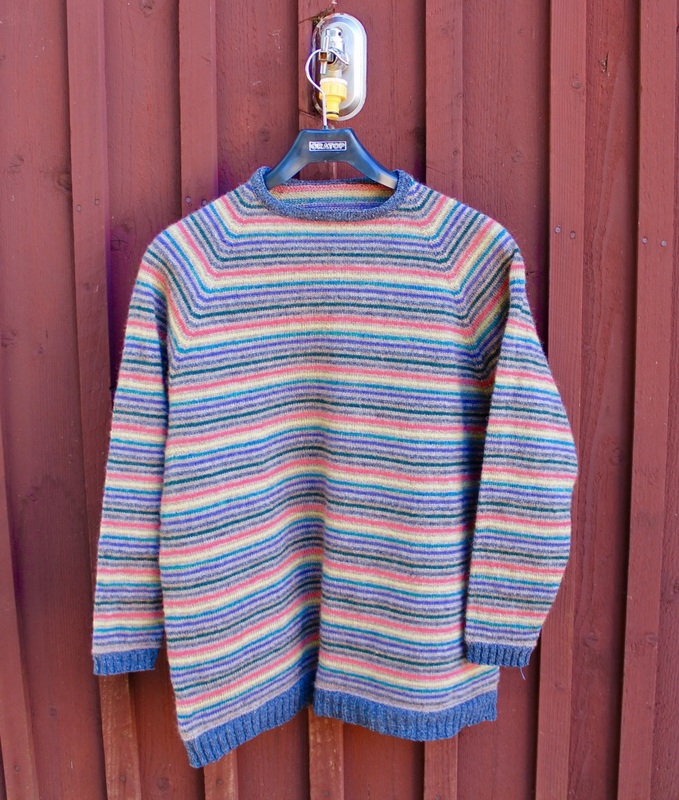 The sweater is unique because of the use of colours: the pink yarn used has not been found in sweaters for adults. I took this photo when I had finished the sweater. 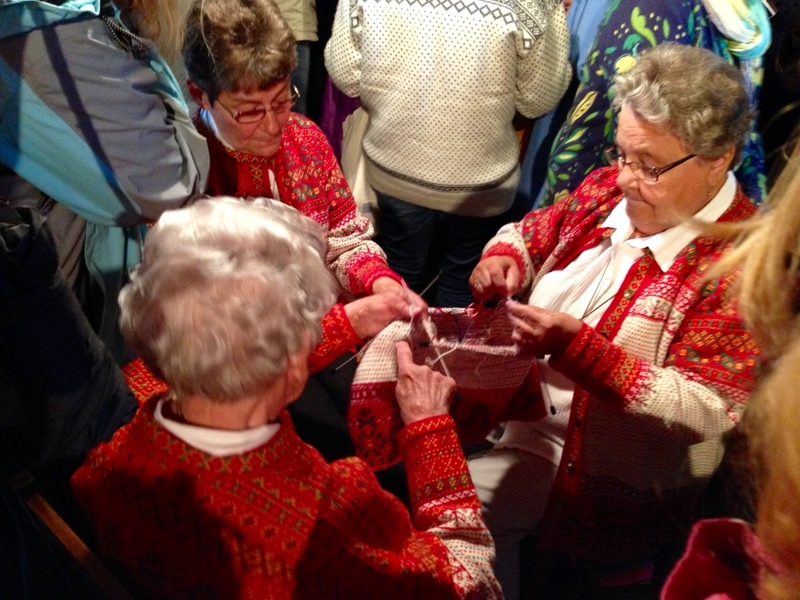 Korsnäs sweaters are unique because of the techniques used, and because of the many colours in a culture where the natural sheep colours white, brown, and black and blends of those was much more common: there’s tapestry crochet in the hem, the upper part of the body, and in the cuffs and upper parts of the sleeves. 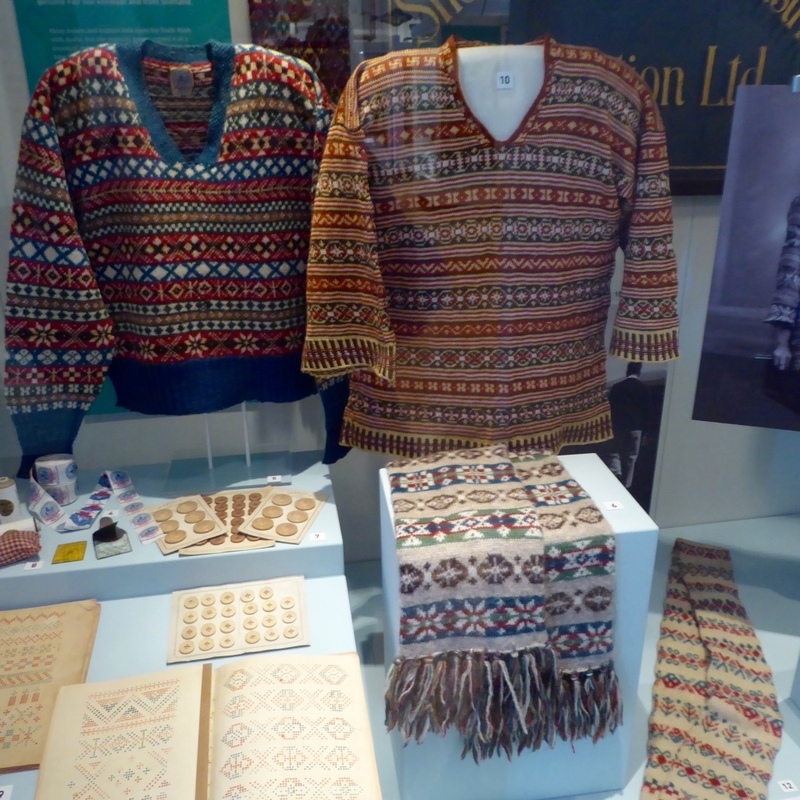 The “lus”-pattern known from Norwegian sweaters is knitted. 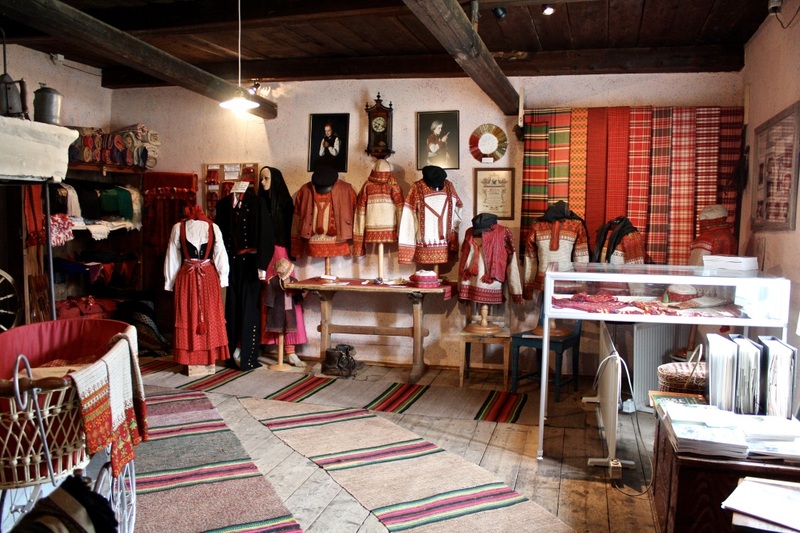 The sweater is named after the municipality where it’s been made since the 19th century. 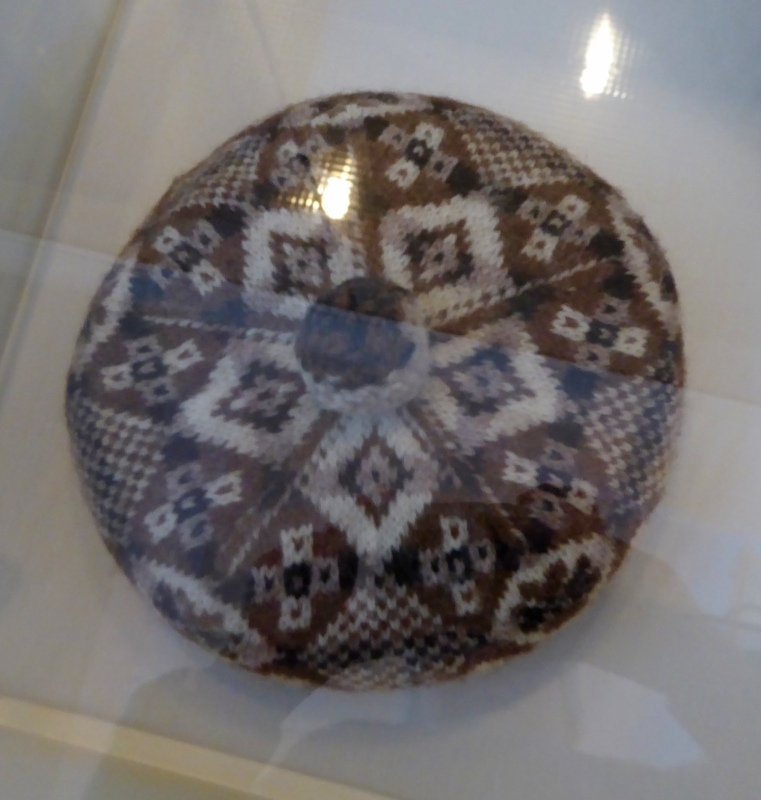 I visit the small museum in Korsnäs almost every summer. The impression when you enter the room with the sweaters is overwhelming every time: it’s so red! So colourful! It’s a wonderful room. The tapestry crochet was always done by an expert. Not many could do it. 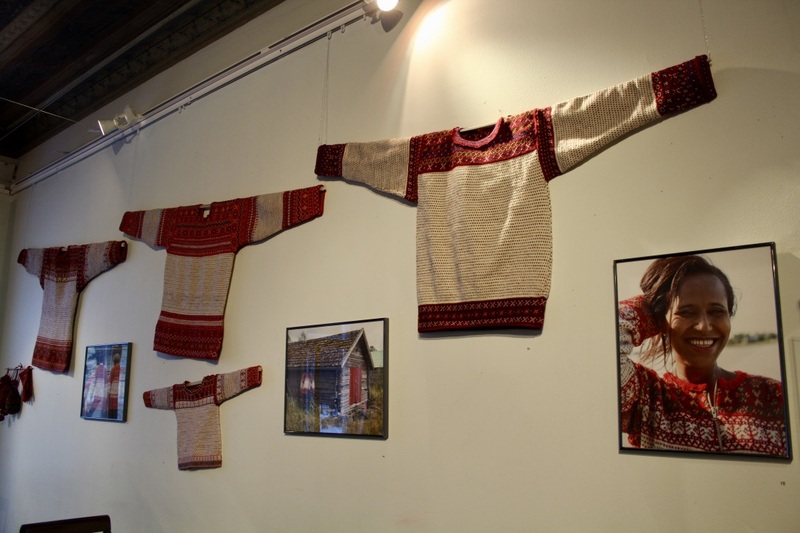 I first learned to knit and crochet the Korsnäs sweater at Marketta Luutonen’s first class in 1982. Even if I haven’t made more than two adult and this one child sweater, I’m fascinated by it. I really do want to make one more. 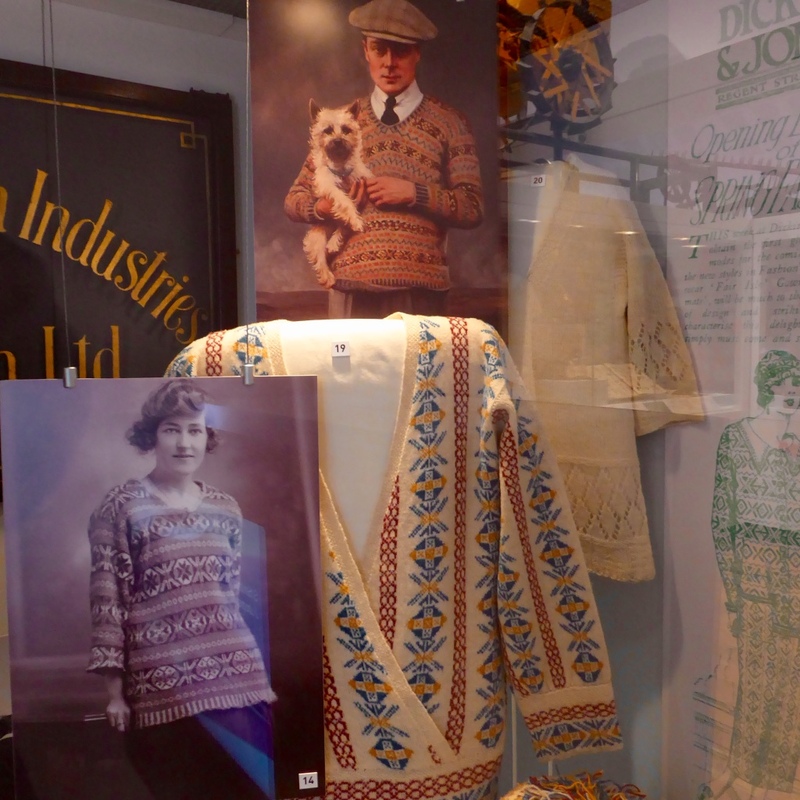 This is also from the exhibition. My small sweater compared to the ones for adults. The book has 255 pages, 23×30 cm, printed on high class paper with a beautiful layout. It’s written in Finnish, and there will be a Swedish version in the autumn. I don’t know anything about an English version, but my personal opinion is that this is a book that should be translated. The quality is amazing all through, and I’m sure the sweaters, cardigans, purses, mittens etc would interest a bigger audience. 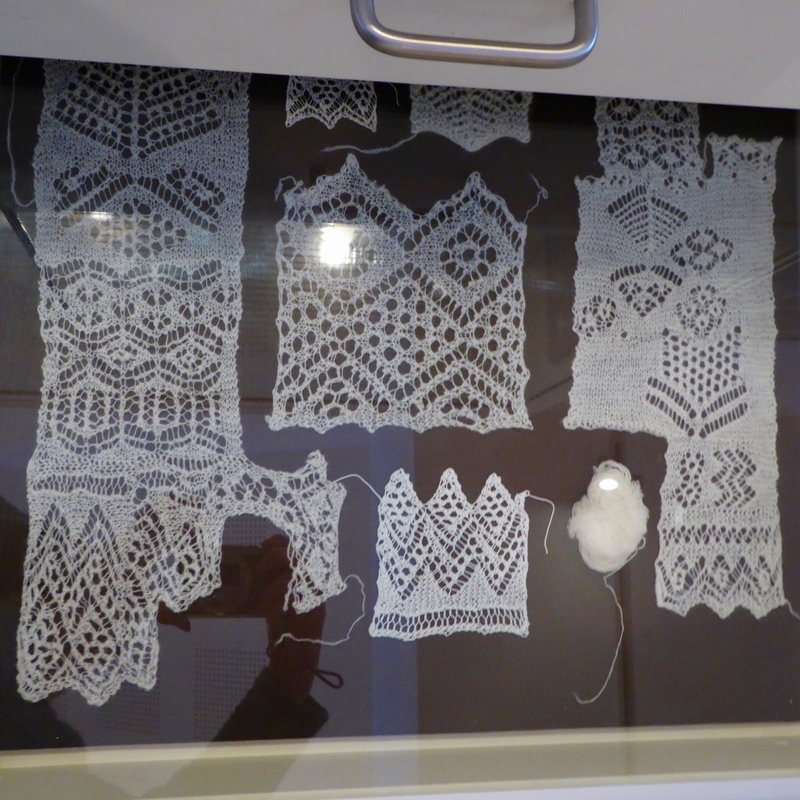 Besides the expertly written section about knitting and crochet history in Finland, there are also written patterns with charts. My sweater modeled by a lovely boy! 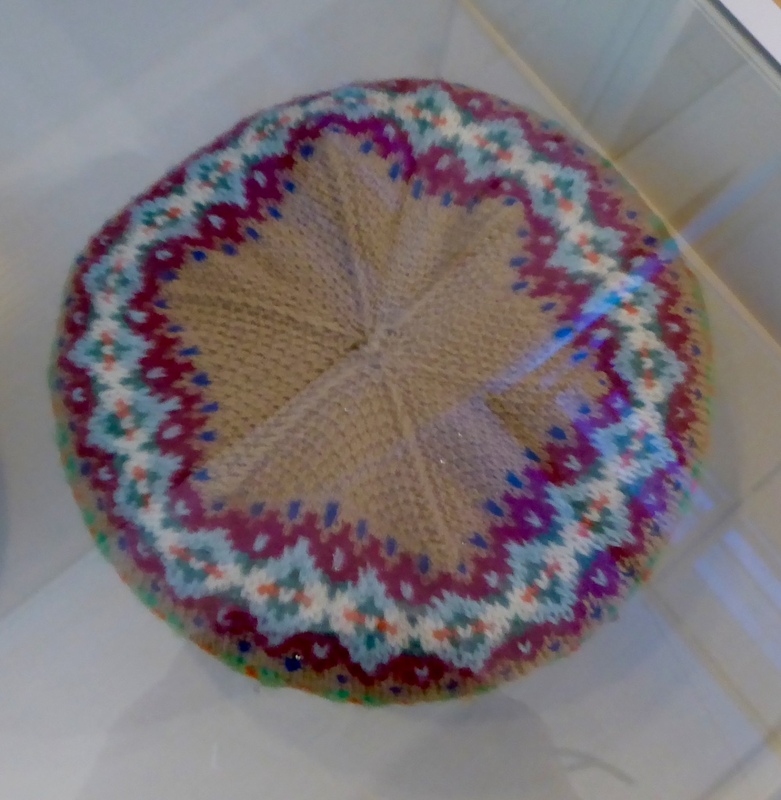 I have a few of the myriads of books on knitting in Shetland. As with my spindles, when I’ve bought yet another book I always think “OK, now I don’t need another one”. And as with spindles, eventually I find that I’m wrong. I gladly recommend all the books I show you today! 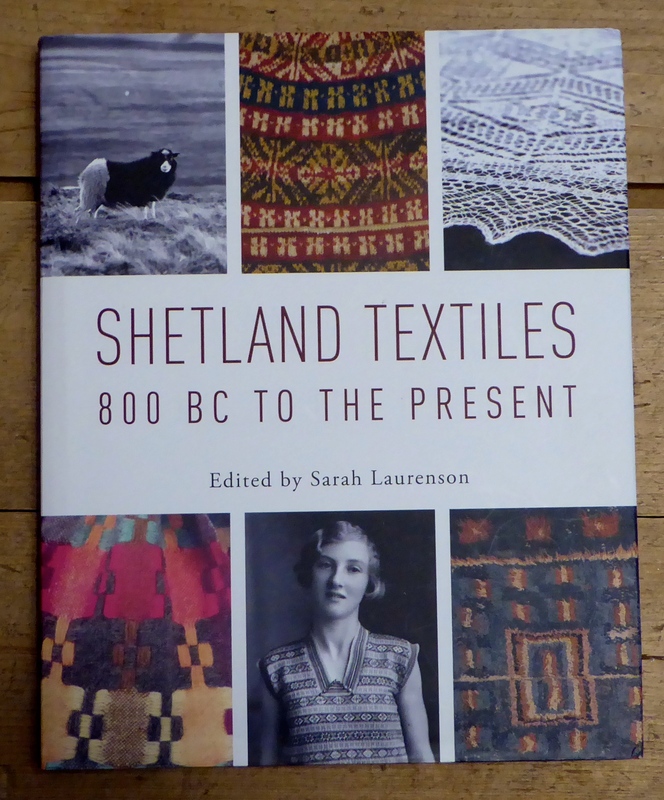 The textile tradition in Shetland is so overwhelmingly manifold, that one book in your textile library just isn’t enough. As you can see, two classics (McGregor and Starmore). I think you can survive pretty well with those two. 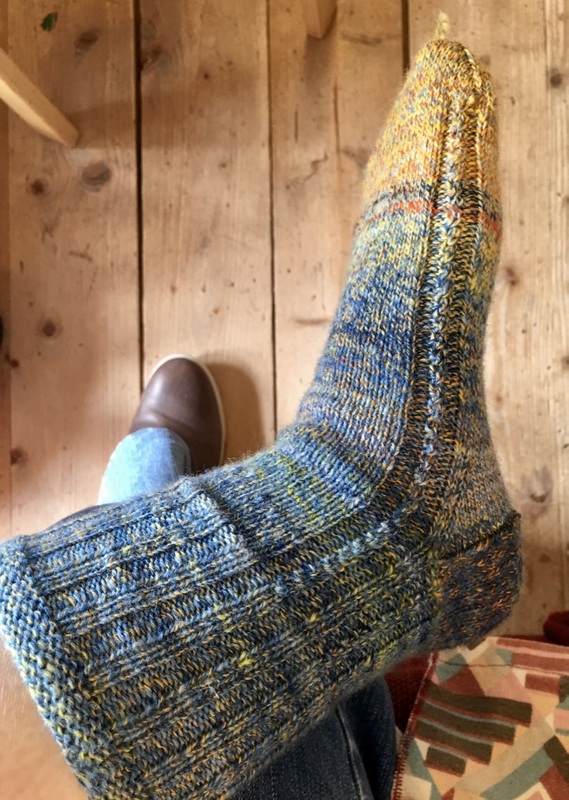 Kate Davies is a must for all knitters! For me she represents the very best of new designs leaning on tradition. And the photos are wonderful! 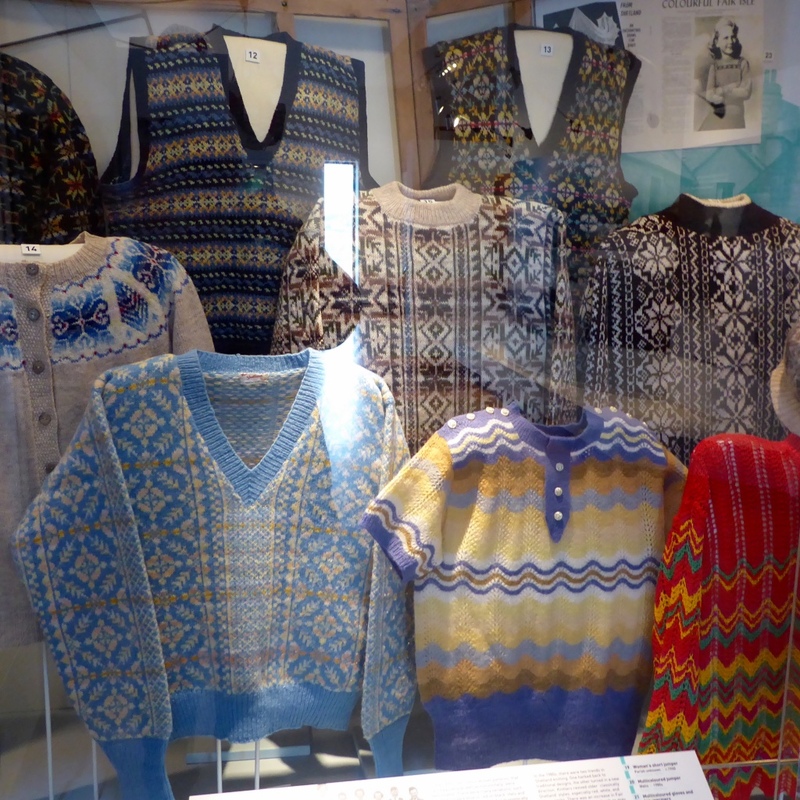 “Knit Real Shetland” is a collection of new designs by among others Jared Flood, Hazel Tindall, Gudrun Johnston, Wolly Wormhead, Sandra Manson, Mary Jane Mucklestone, Mary Kay. “Stranded Colourwork Sourcebook” by Felicity Ford (Knitsonik) shows you how to make your own designs by using colours and shapes in your surroundings. Felicity is also behind Wovember, the great event we all look forward to this time of the year. 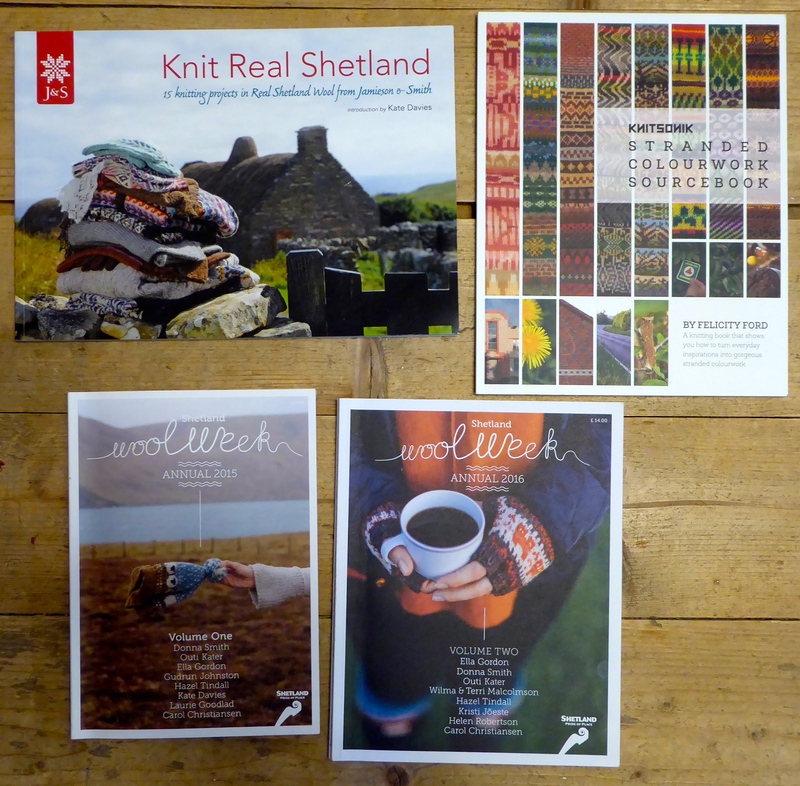 “Wool Week Annual” 2015 and 2016 include essays about Shetland textiles, and designs by designers like Hazel Tindall, Donna Smith, Gudrun Johnston, Outi Kater, Ella Gordon, Wilma and Terri Malcolmson. 2015 is sold out, but 2016 can at least today still be purchased here. 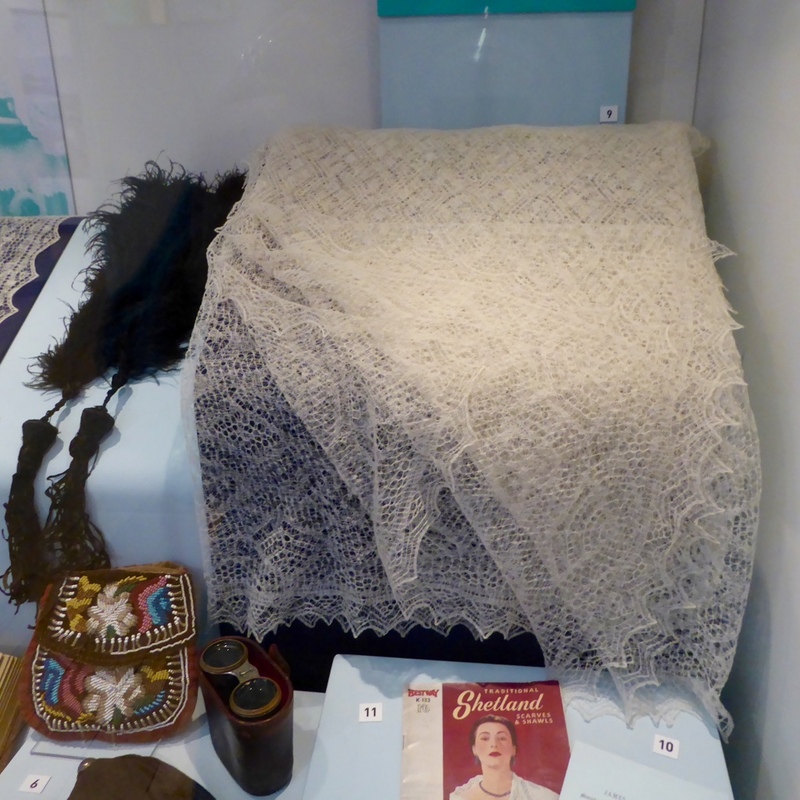 I love knitting lace, and Shetland lace is especially dear to me. I have books on lace knitting in Estonia and Russia also, but I always return to my Shetland lace books. I must confess: I read the books, and look at the photos more than I knit these complicated looking designs. I know it’s less difficult than it seems, so now I’m totally determined: the Premium fleece I bought at Shetland Flock Book will become a Shetland lace. 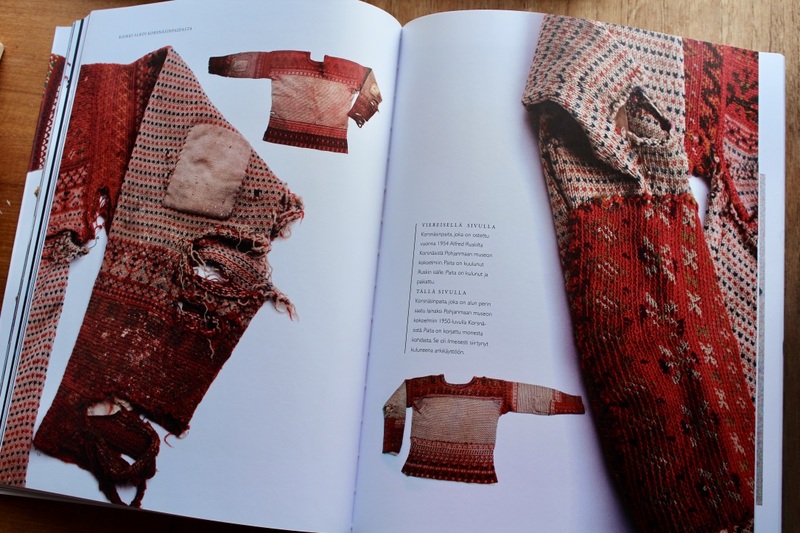 “Heirloom Knitting” by Sharon Miller is out of print, but can sometimes be found as used copies. 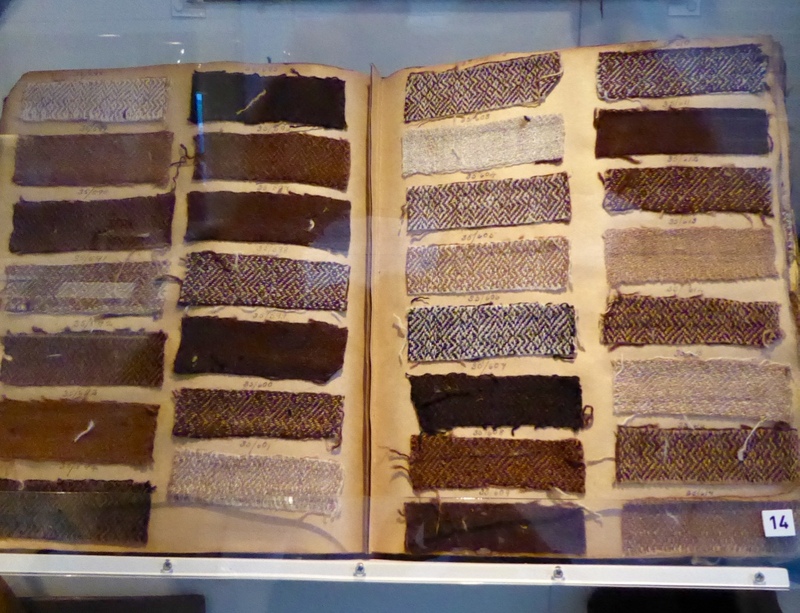 This book is considered to be THE book about Shetland Lace. 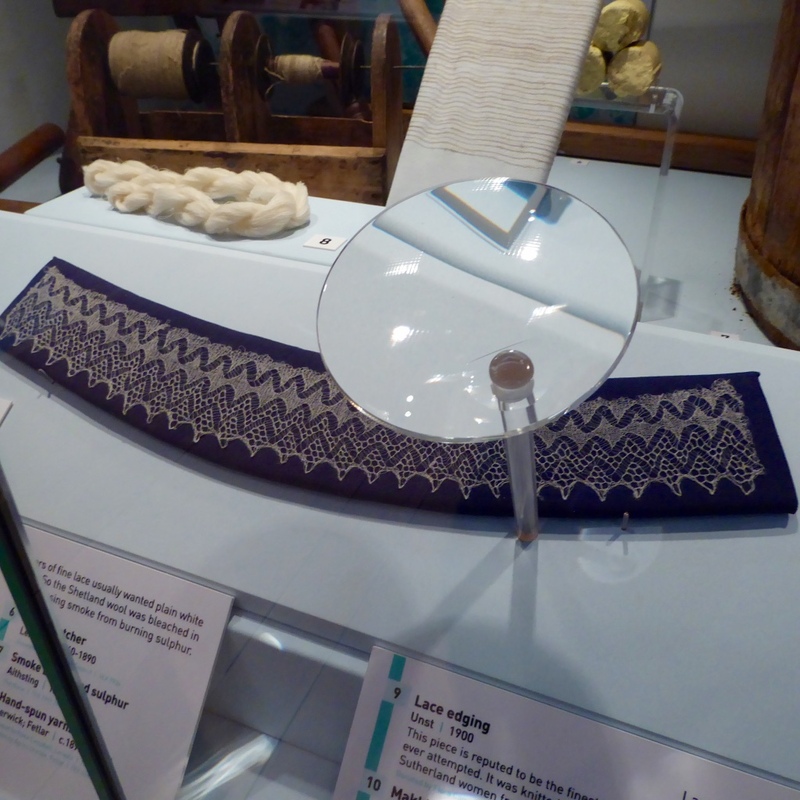 Liz Lovik’s two books, “The Magic of Shetland Lace Knitting”, and “Magical Shetland Lace Shawls to Knit”, are two books with admirably well and logically made instructions, easy to follow and understand. “The Book of Haps” is edited by Kate Davies. 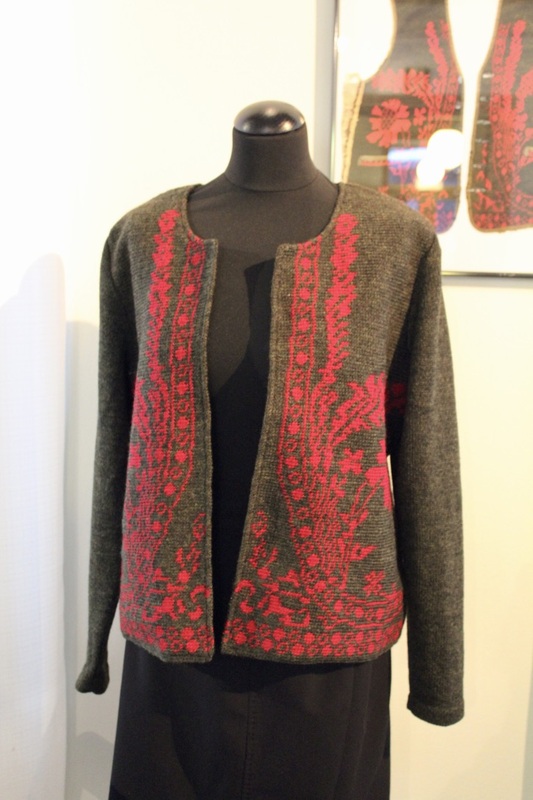 It’s a collection of hap patterns designed by a number of skilled designers from several countries. 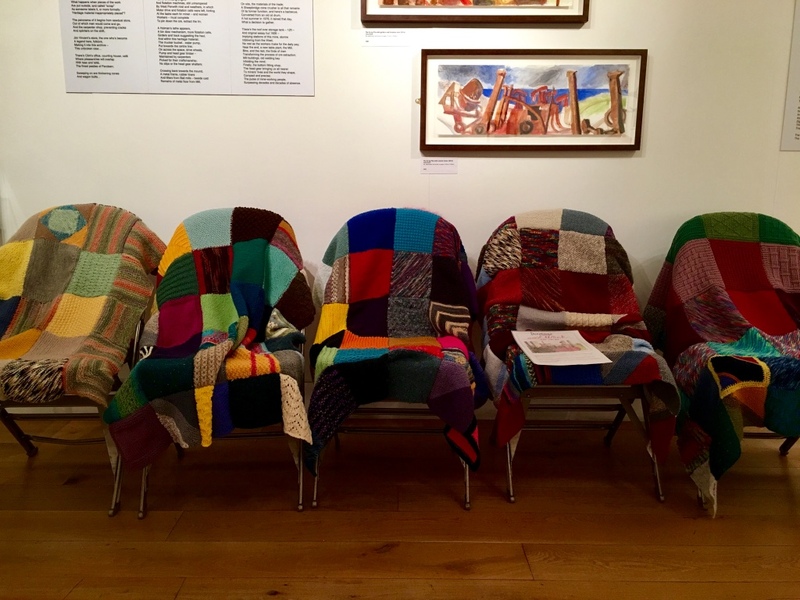 As the term “hap” suggests, the shawls are designed for everyday use. 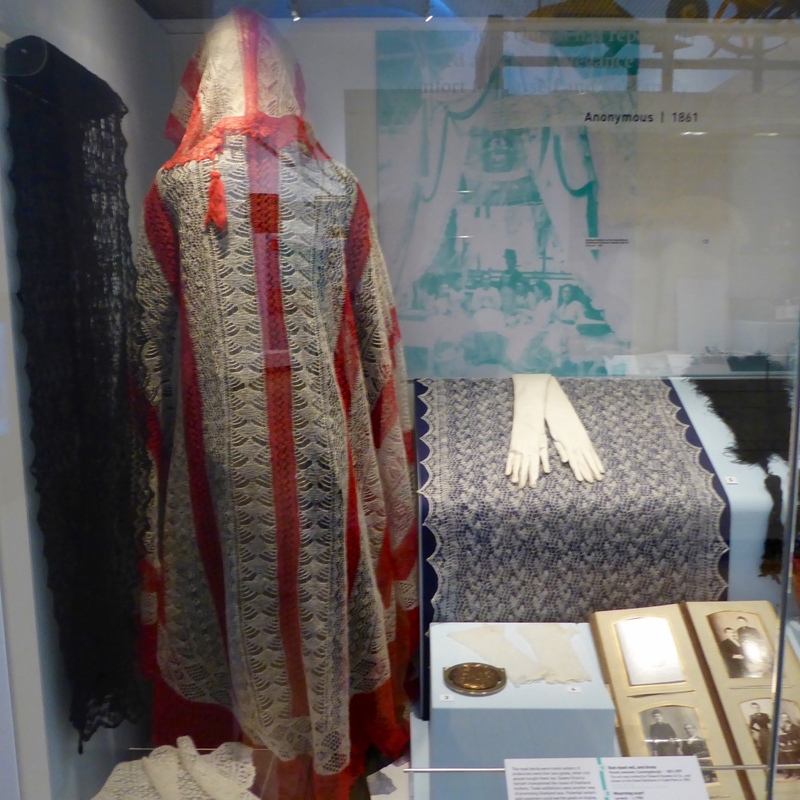 The book also has also a fairly long essay about haps and shawls, written by Kate Davies. All the books above have articles about knitting in Shetland. 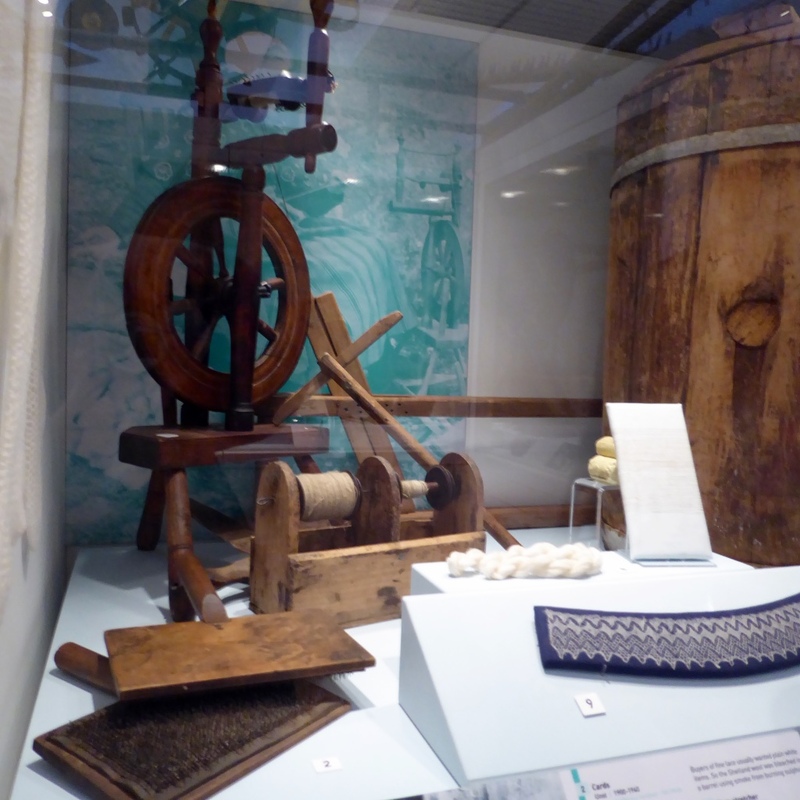 “Shetland Textiles 800 BC to the Present” has no patterns, but is just like the titel says, a history book. Of course, you can’t go deep into the different techniques in just one book, but as an introduction it’s very good, and so beautiful! 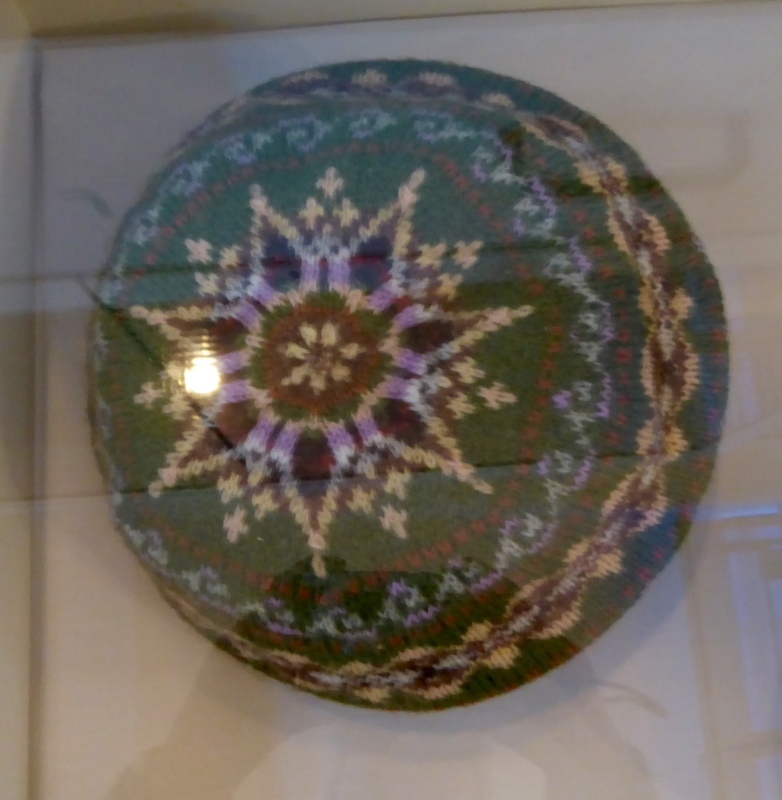 I forgot to buy a book I’d really love to have, but forgot to buy during Wool Week: A Shetlander’s Fair Isle Graph Book by the Shetland Guild of Spinners, Knitters, Weavers and Dyers. I’ll buy it as soon as my credit card has recovered from my trip. 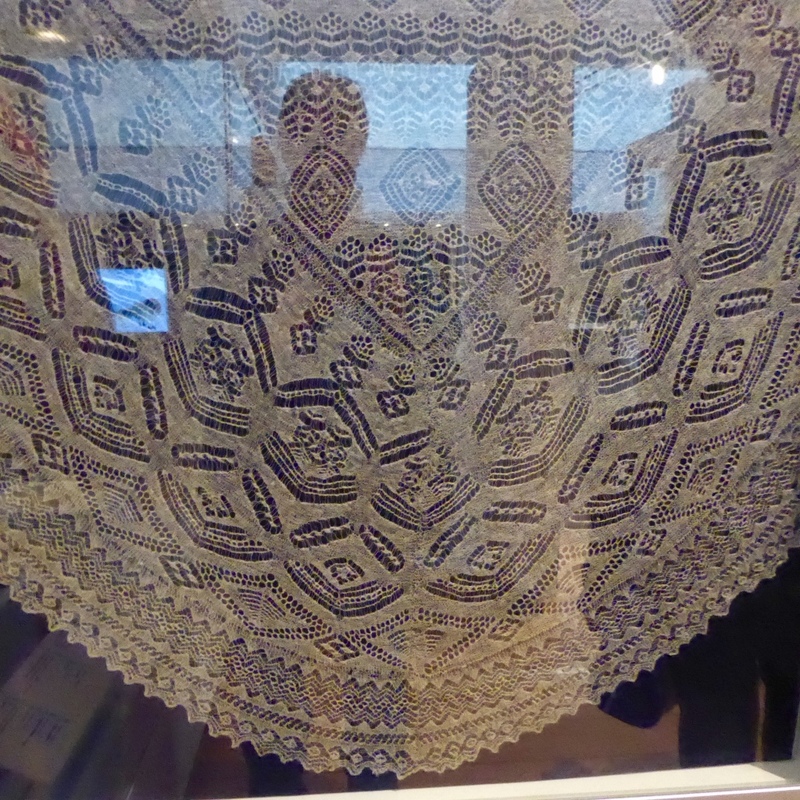 Another book on my wish list is “A Legacy of Lace” by the same guild, also to be found at Jamieson and Smith. 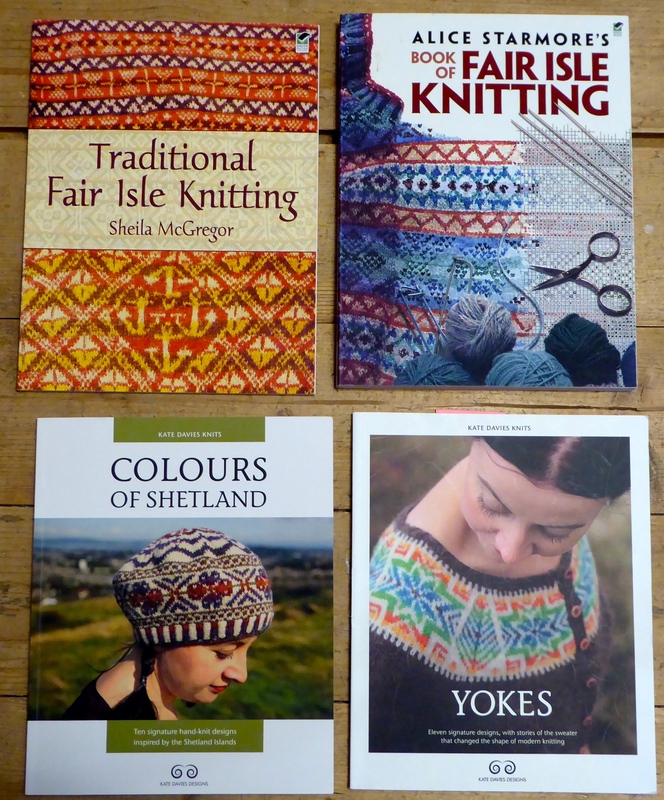 I also have books that only have a couple of Shetland patterns amongst others from all over the world. 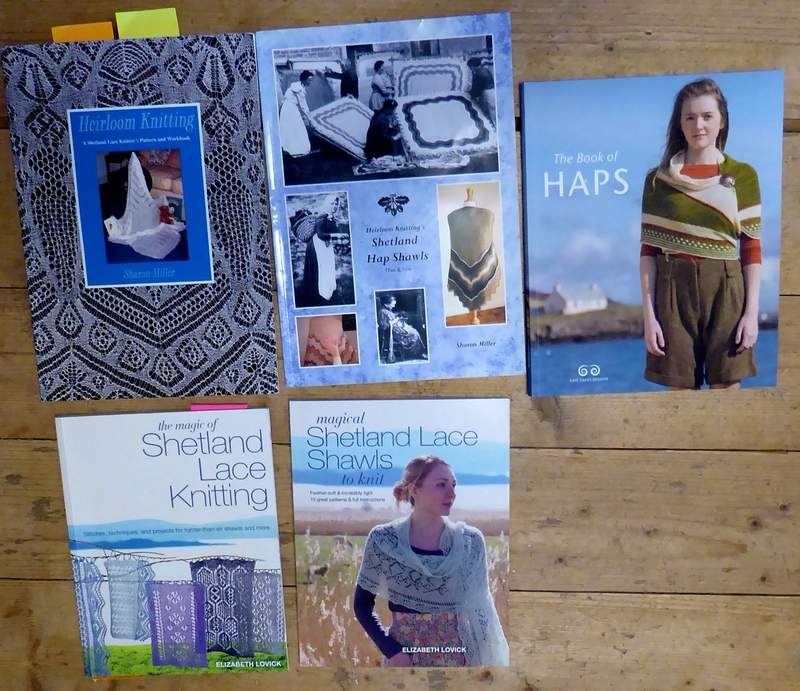 But if you really want to learn about and understand Shetland knitting, you need books that concentrate on the topic, and that preferably are written by people from Shetland (or at least Scotland Mainland). They know what they are talking about! 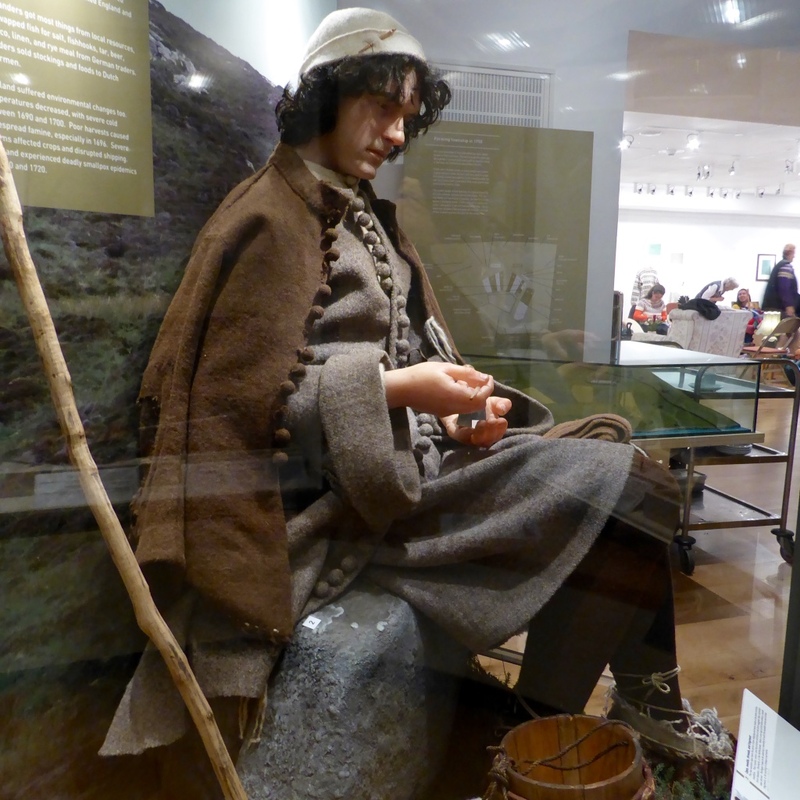 I very soon realised that when I went to Shetland the first time. Today I want you to watch Josefin Waltin’s beautiful video “Slow fashion – from sheep to sweater”. While on Youtube, watch her other videos! There’s one on how to spin on a supported spindle which in my opinion is one of the best instruction videos about this technique.